Imagine you are sitting on a charpoy or string bed under a big neem tree, with kids playing around while peacocks dance near you! Top it off with hot poha breakfast being served to you, sounds bliss isn’t it? Well this is what I experienced and much more while we went on yet another agri tour near Pune called morachi Chincholi. 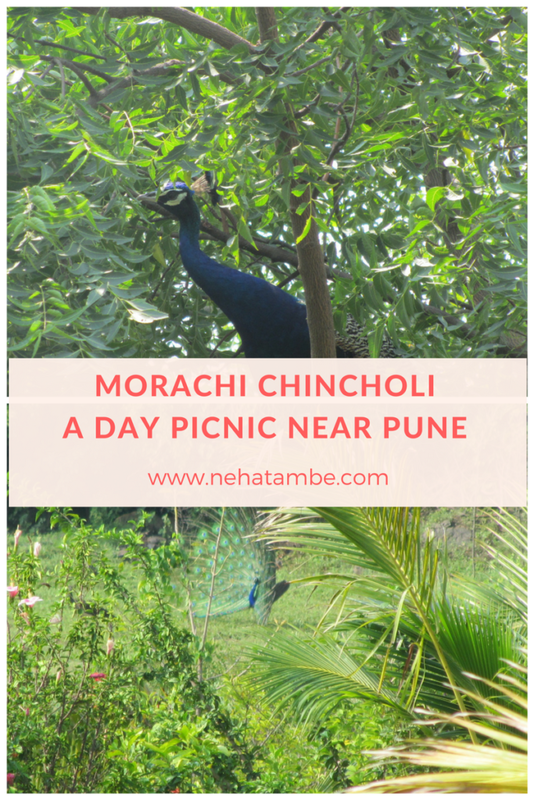 Morachi Chincholi literally means peacocks in tamarind trees. This is a perfect day visit trip if you want to take in fresh air and not worried about your kids running berserk in the farms. On a typical boring mid- week during last summer vacations we hit upon this idea of exploring some not so popular places. Though we were nearing june, there was still time for schools to reopen. We didn’t want a long vacation as both of us didn’t have leaves. So this meant it had to be a weekend, and we all know weekends are chaotic and crowded at all popular places! After doing some research, we figured Morachi Chincholi looked like a good place to go. My kids had never seen a peacock in the open and so they were enthusiastic about it. I prayed that it does not end up being a fiasco as I was skeptical about peacocks in open coming so close the human habitat and thriving. We spoke to Mauli Agro tourism and finalize the place. We decided to leave early in the morning so as to see the birds in time. We reached around 8:30am and were welcomed by the family. I forget the name of the owner, but it was a lovely family – very hardworking and cheerful. This was a pure veg place. Under a big tree there were lots of charpoy’s arranged. While we settled in, we were given a breakfast of Poha and hot tea! From the place we sat, we could see open fields, that were made ready for sowing, a small play area for kids to the left and lots of trees – fruits and herbs behind us. It was extremely pleasant in the morning. As we were contemplating, if we should take a walk around, the birds made their appearance. Two peacocks were in the field and walking around with their plume in full bloom. Don’t feed the birds. Only my family can do that, as birds know us and we know what they can eat. We consider these peacocks as part of our family. We won’t let you go near it or scare it for whatever your reasons. In case of such an action you will be asked to leave immediately, without refund. As we nodded our heads in agreement and my kids very seriously promised him to not break an rules, he explained further ” This is the mating season for the peacocks. There is probably a peahen on the other side of the bushes and both these peacocks are trying to capture her attention. We tried looking and realized there was a very young peacock perched on the tree top. It had been absolutely quiet and we didn’t realize it to be there. After a while the owner’s wife, came out to feed the birds and threw some grains around. Two birds came over to eat the grains, however a chase between a cat and a dog scared one of the birds and she flew up the branches of a tree. She was probably scared as she started calling in a loud voice. The owners wife, ran out and shooed away the domestic animals and started talking to the peacock! The funny thing was the bird calmed, it was reacting to her voice and started coming down a few branches. All this drama kept us entertained till lunch. Lunch was a typical rural Maharashtra fare with bhakri, pithala, usal and rice. After lunch we went around the farm, saw another peacock in the mango groove. Apart from this, there was a bullock cart ride and a tractor ride! My son found it more fun to feed the Ox while my daughter insisted on riding the tractor than having a ride in it! 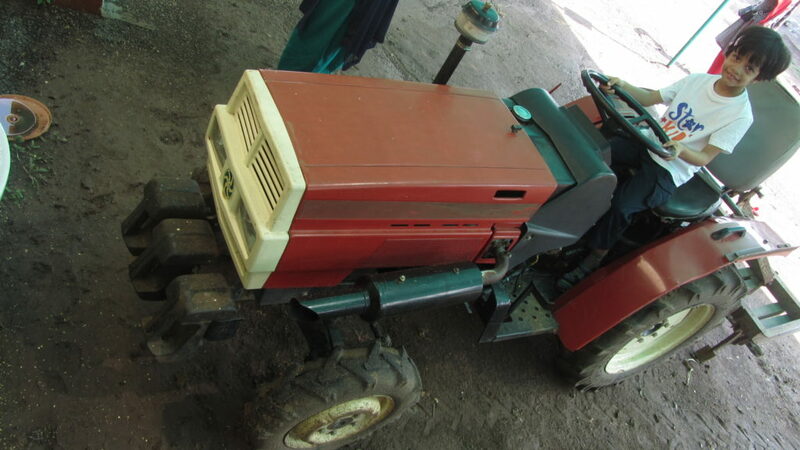 The owner obliged and let her click some pics once the tractor stopped. All in all this was an absolutely leisure trip that was fun in many ways! We were gadget free that day, apart from the camera of course and not once did we find it necessary to check on mails, or play games (adults or kids) or even think of that never ending to-do list. We were in the moment and enjoying it one moment at a time. This place look so exciting! nice post, would love to visit this place. Oh wow, nature beckons me with love always n so does this place. Wonderful post. Wow! I’m sure it was a memorable experience to enjoy family time in the midst of nature.A trip like this is surely an experience in itself.Must visit place for nature lovers i must say. Sometimes, in our hectic days, we need such an outing. It was a great fun for you and your kids I guess. Pecoacks are beautiful we all know that. So watching them closely give us pleasure always. Seems like husband is going to be on driving seat for consecutive weekends now. This place was in my travel list long ago. Thanks for reminding. hehe, attitude issue.. does this ring a bell for some entrepreneurial decision regarding your farmhouse! Oh Neha. Your description of the nature’s picturesque beauty while holidaying with your family in the greens while relishing piping hot kanda poha is beyond words. I’d love to explore Morachi Chincholi too apart from the other 5 places you mentioned around Pune in your other post. I love going to picnics but never knew there is such a nice picnic spot in Pune. Wow this place is so mesmerizing Neha. This looks like such a fun place. If I visit pue anytime soon, I will go there with kids!